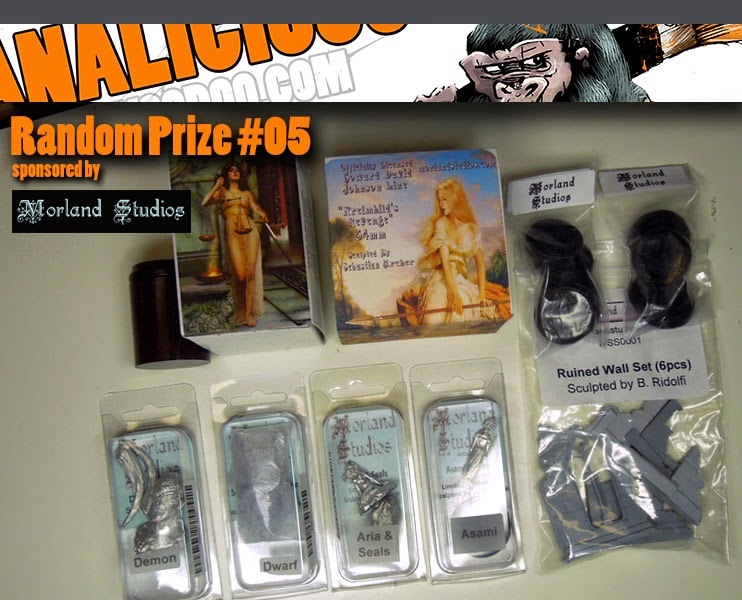 BANANALICIOUS Painting Contest - Random Prize Pool Update! to all the great sponsors for MV's Bananalicious Painting Contest 2 we are able to present you another update on the Random Prize Pool. Do not forget to take part in the contest - find all the rules and information here! 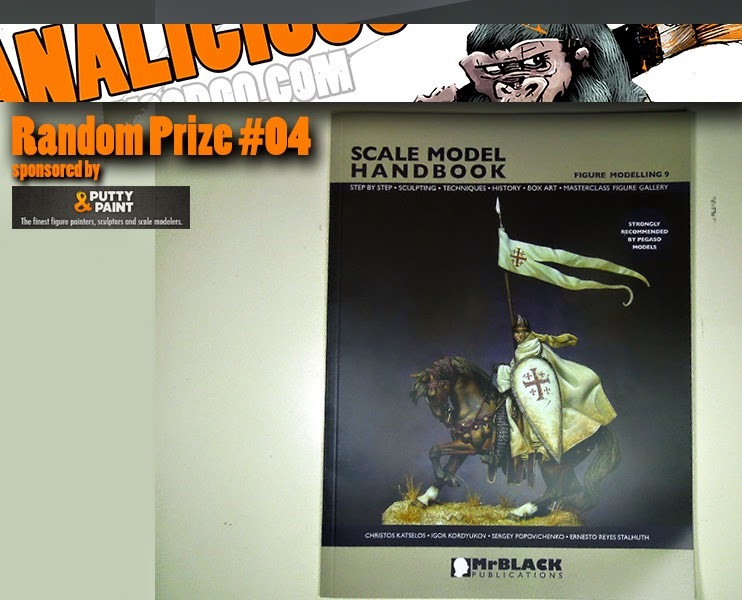 Putty&Paint throws issue number 9 of the Scale Model Handbook into the Random Prize Pool. This is definatly a good read! 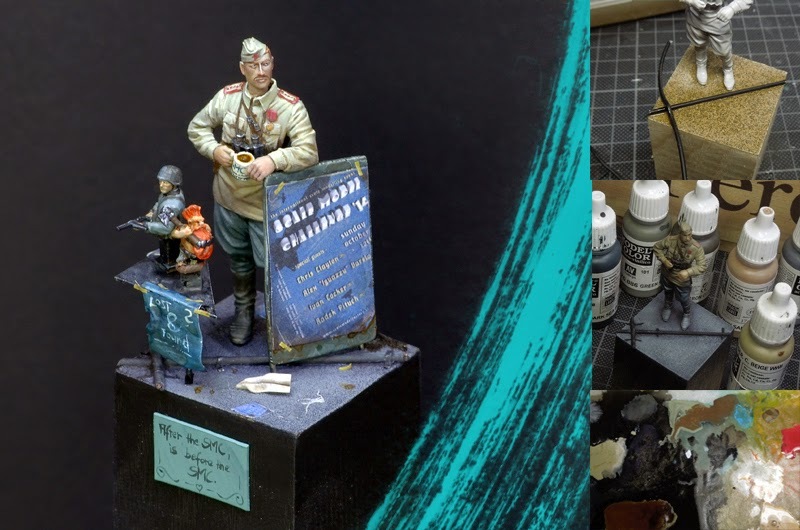 Morland Studios hands out tons of miniature- and hobby candy. This is the first set of their sponsoring. 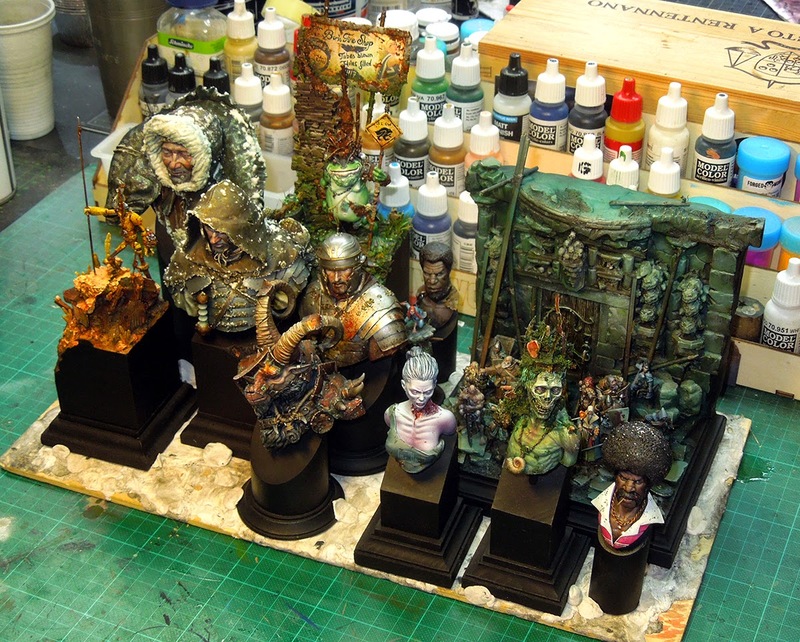 A great mix of different sized, beautiful miniatures, some basing material and a plinth. 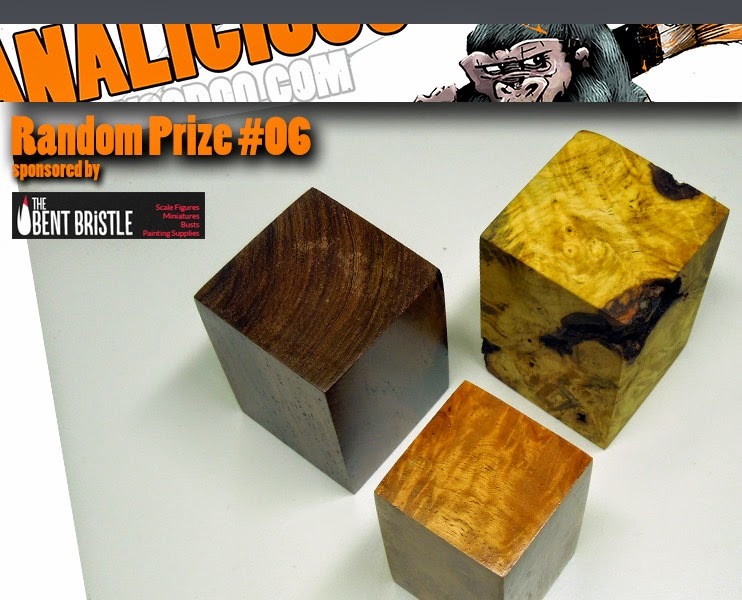 The Bent Bristle throws three handmade, beautiful plinths into the random prize pool. it has been a while since I wrote my last WIP-thoughts. 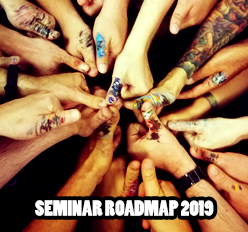 Now it it's time for it, but be warned this write up is also mixed with Kong Fu, some very personal thoughts of mine to explain my painter's soul nowadays. It happened some days after the Monte San Savino Show. Monte always marks a spot for me in the year. A spot where I feel the need to calm down. Autumn is standing at the front porch, telling you that winter might soon arrive and well I am a child of the summer. I love it warm, sun, power, endless energies. 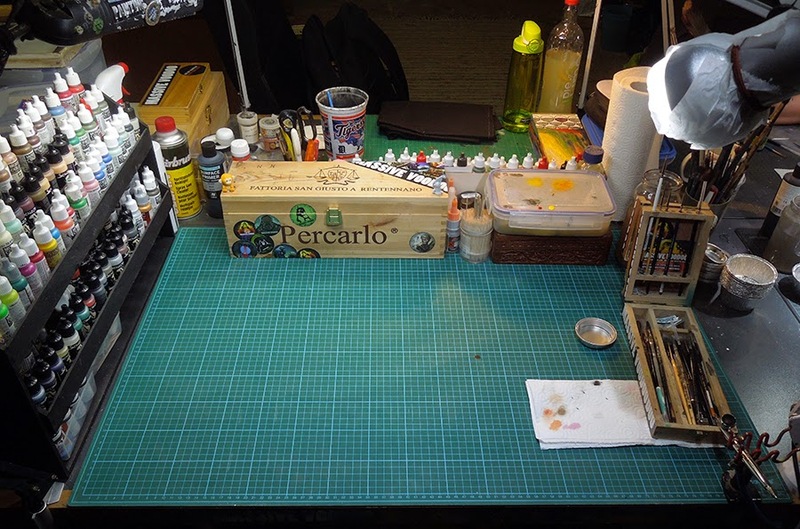 My miniatures I took to Monte San Savino Show. Autumn for me feels like, honestly: Blahgnarglohnowhybluargh! I do not know why but it feels stranger every year. I feel the need to calm down. Focus on myself, drink tea, do less activity in the internet. Maybe I just need some holidays after this year passed without one so far. I said it happened some days after the Monte San Savino Show. That weekend was beautiful and really great, but it also marks a spot. 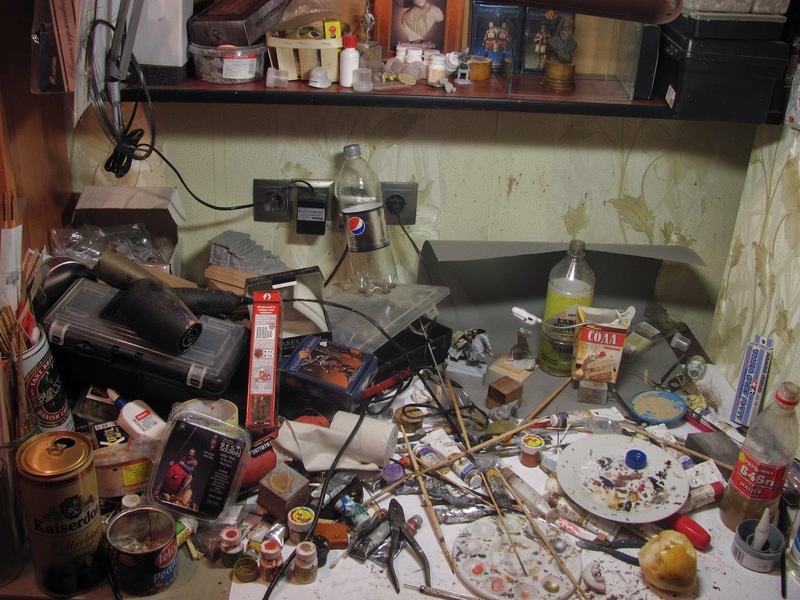 A spot telling me the 'season' of this years miniature painting madness is over. Sure there is still some private coachings and a painting class in the Netherlands ahead and I won't calm down on these, but I feel to calm down for myself - for example by trying to write something on MV every day, answering my mails like a greek god of speed ... calm down and breathe. Drink Tea, find time to search for new music I like, enjoy good books while drinking tea. I think you are getting the idea of what I am talking of, eh? Well, being back in the studio after the show in Italy felt very strange. First of all I took most of my finished models home into my cabinets to have the studio's cabinets free for new ideas and projects. Some were sold and are at the moment shipped through the world. Then I tried to paint and painting was no fun. So I cleaned up the place. I just don't know, but that felt good. Since then I am not caring to much about my autumn-blues. It's there, I accept it, let it happen. The difference to summer is, the power of the sun guides me and I feel strong. Autumn is more like ... I just don't know, I follow where the blues takes me. ... and so far it took me to realize I need to breathe and calm myself down. Taking a little holidays on things in my life that keep me from focus on what is important for me. Some of the past weeks were truely filled with me going to bed so early it did not feel 'normal'. 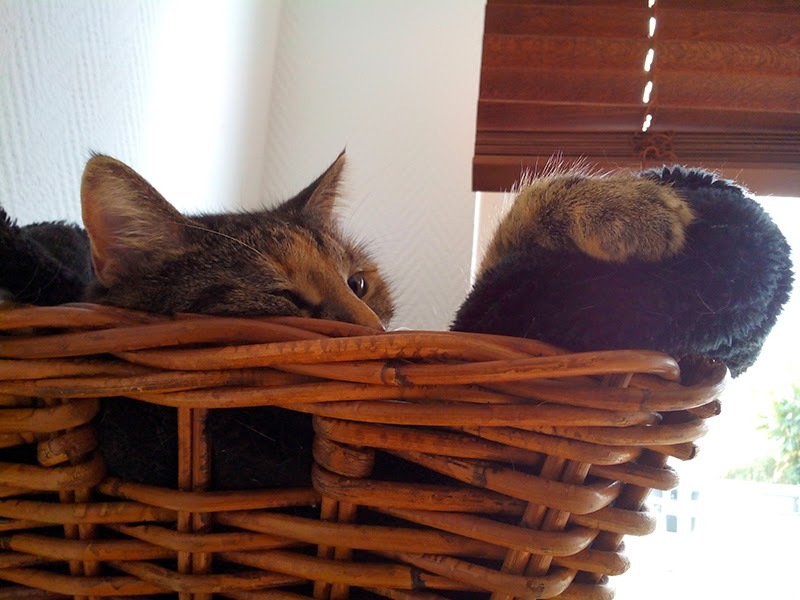 In autumn I just want to be a lazy cat. 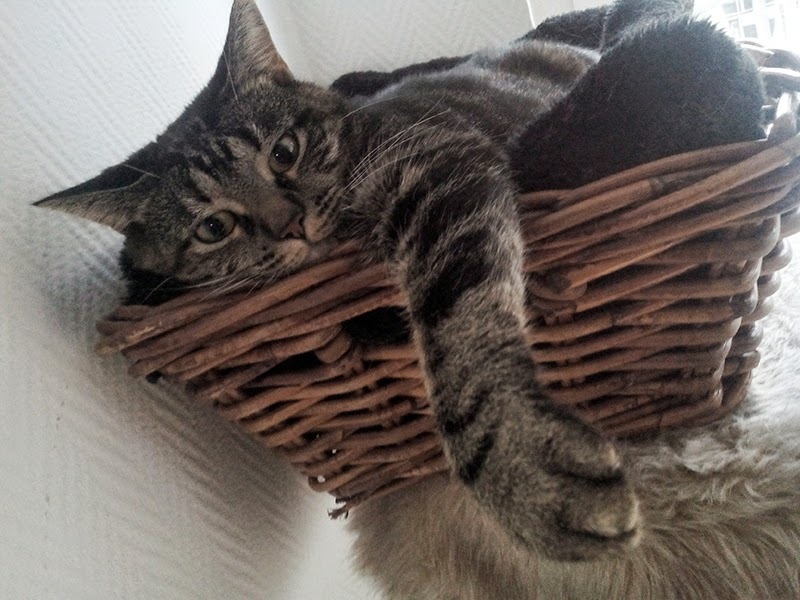 ... but I quickly realized I am no cat, no matter how early I try to get myself to sleep. My mind needs to work and luckily autumn does not take me down like it did in some of the past years as I learned to work with my energies and capabilities. I learned to take a breath in the right time and now it's that time. drinking tea to it, was truely relaxing. 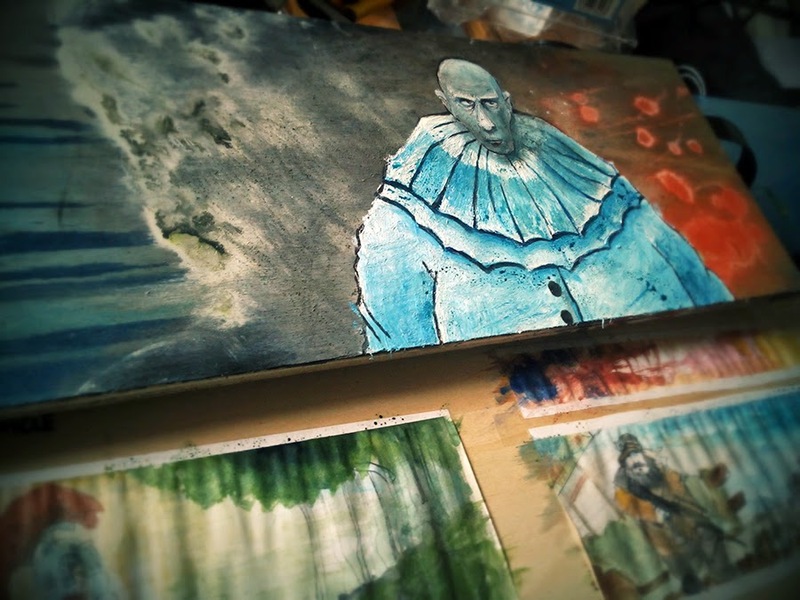 I even took out a truely old WIP from 2010, to have some relaxed painting strokes on it. Without any pressure, without a goal to push me to my limits - just paintin', drinking tea. 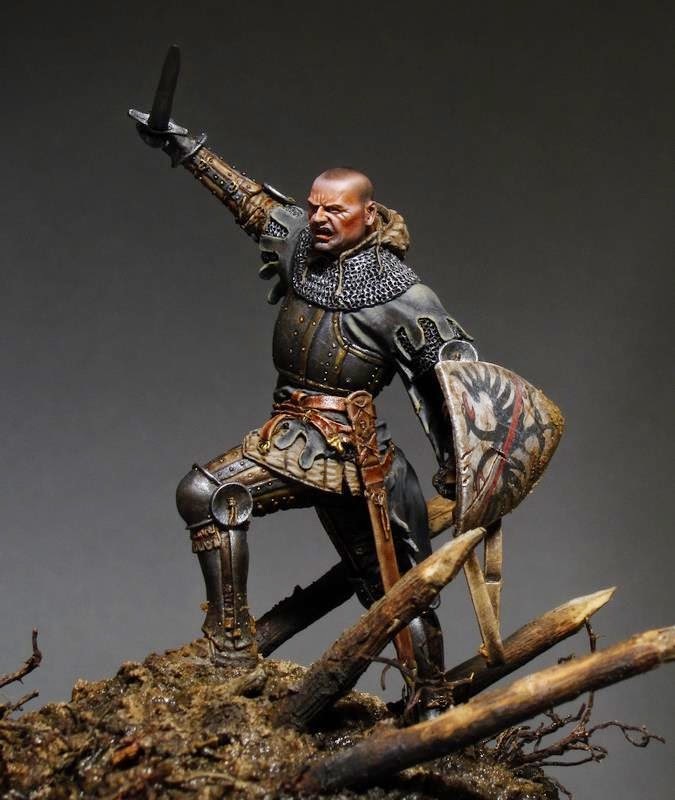 Creating your own Fantasy Weaponry? Well, can I sum up this write up? - No. time for your last tutorial voting winner. 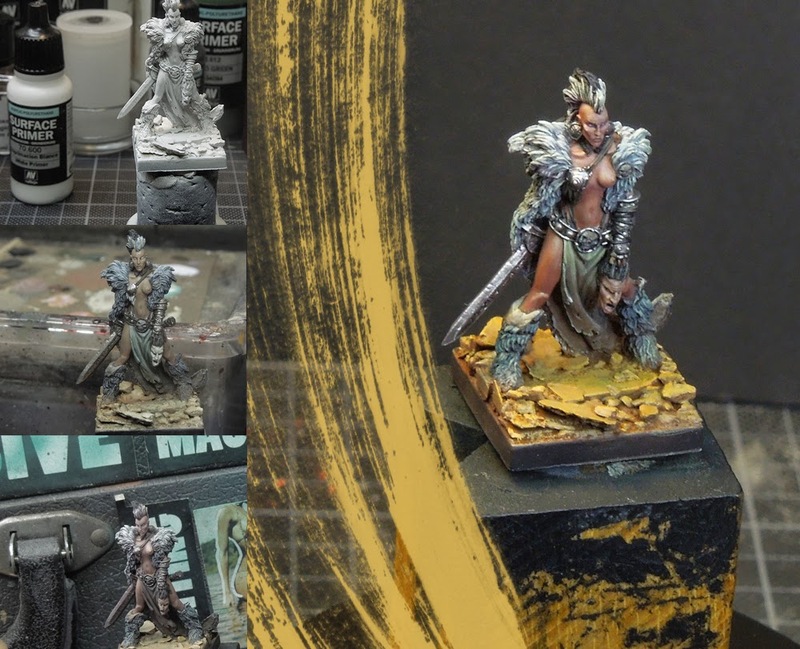 This time Roman talks about painting the Virago (Ilyad Games, Female Vorag Barbarian, a great model, but sad to the toe - very rare as the company Ilyad Games is no more. 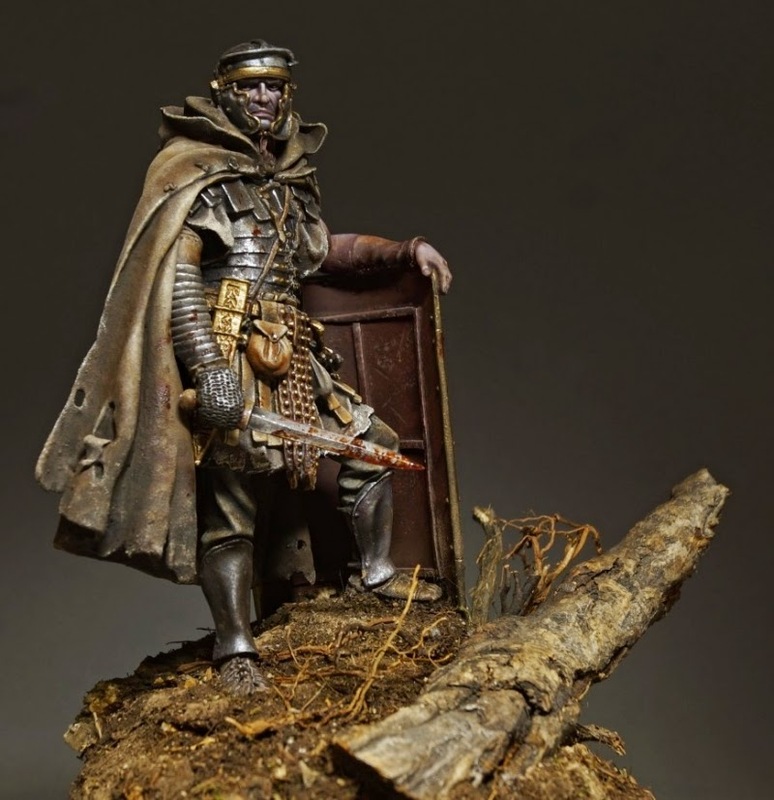 You can find some rare Ilyad Games Miniatures on ebay, sometimes and they are far from cheap. Let's hear what Roman has to say about this lady. 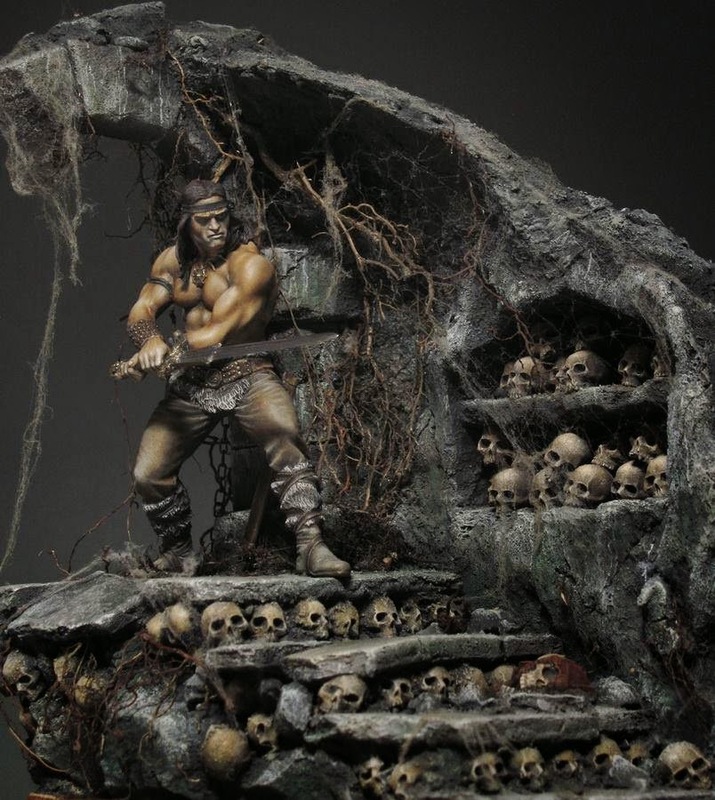 First of all I want to give thanks to my friend Rafael Garcia Marin who played a big part in getting me this miniature. 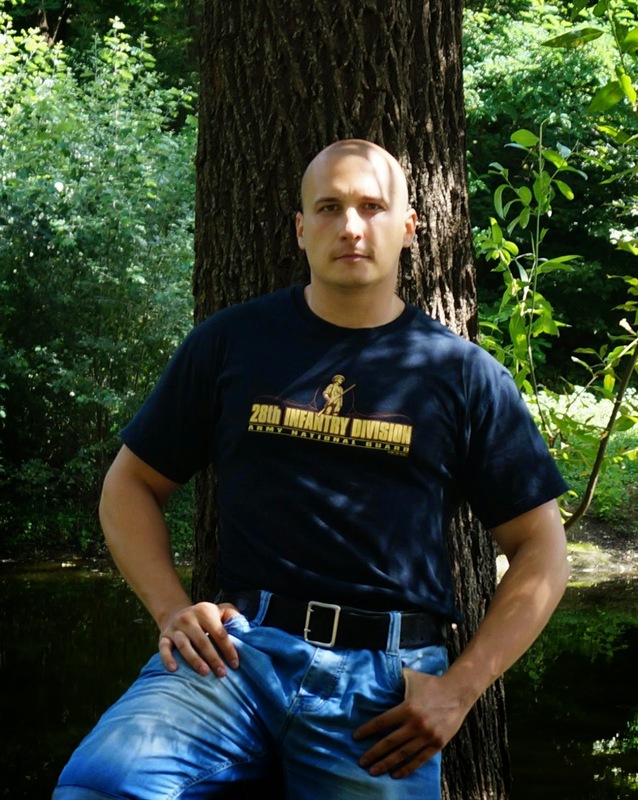 Keep an eye on his blog, it is worth it: Volomir's blog. 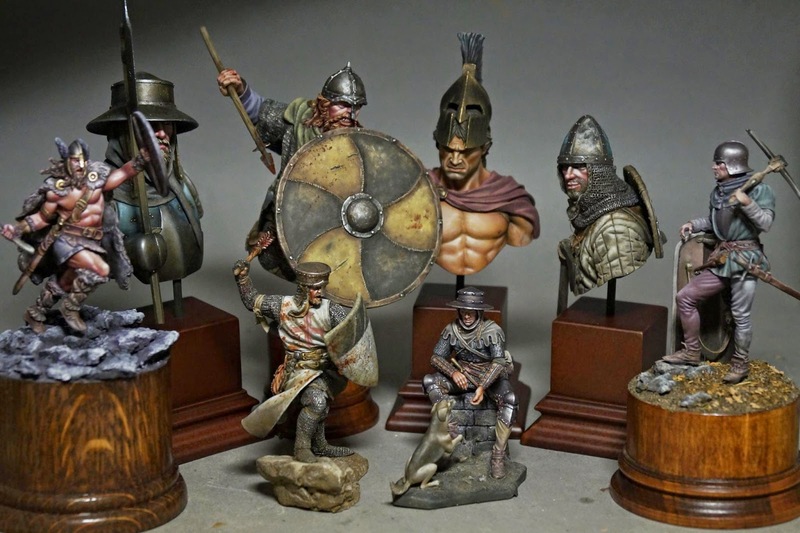 Well, as I am selling most of my own works as I am freelance artist in miniature painting one day I decided to create a little special collection for myself, without selling the models after the paintwork. 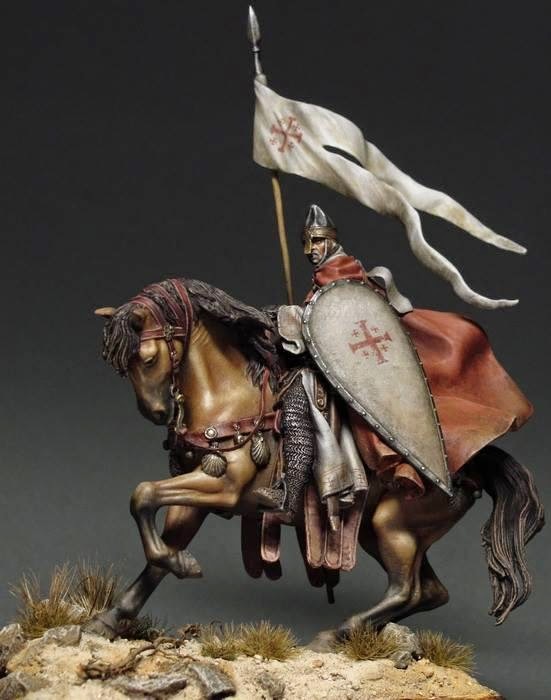 I decided to slowly get my fingers on some Ilyad Games Miniatures via ebay or other occasions. 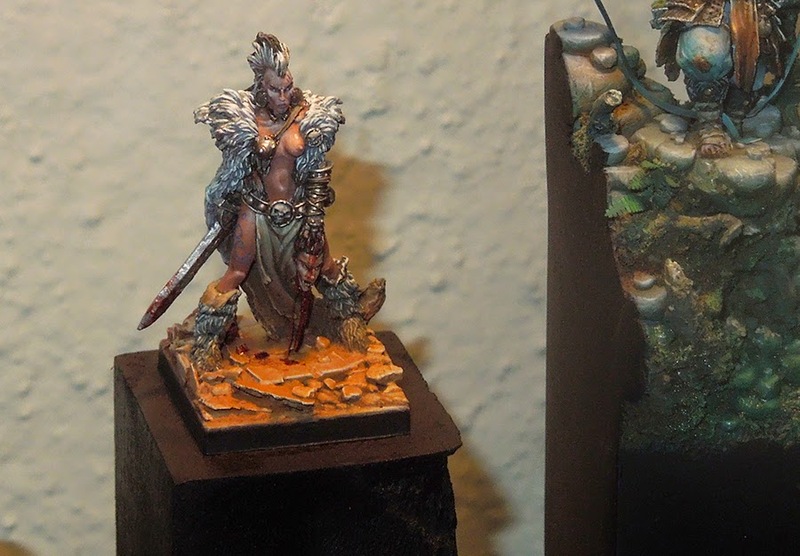 My collection is at three painted models at the moment and some unpainted resin in my drawer. I also decided to create simple bases for them. So I went with some stones with superglue on her gaming base. Nothing too fency, but still nice. 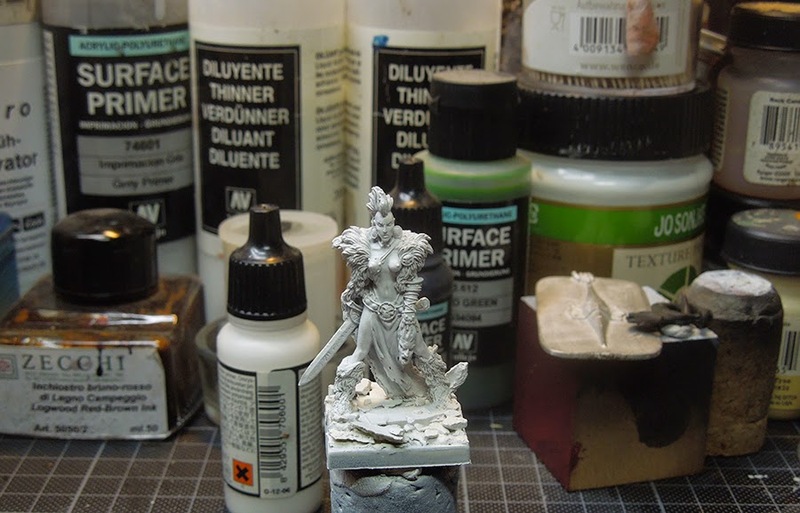 Primed her white with surface primer by Vallejo. Using the airbrush for that. Why? Well, it is definatly finer than using sprays out of the can. Next step was the usual one, taking basic tones for every material and placing them as a preparation for further work. Using the brush here. As you can see in the fur I already included a little light situation sketch, using zenithal light theory while applying my first colour layers. Next step was painting first gentle lights to every area. 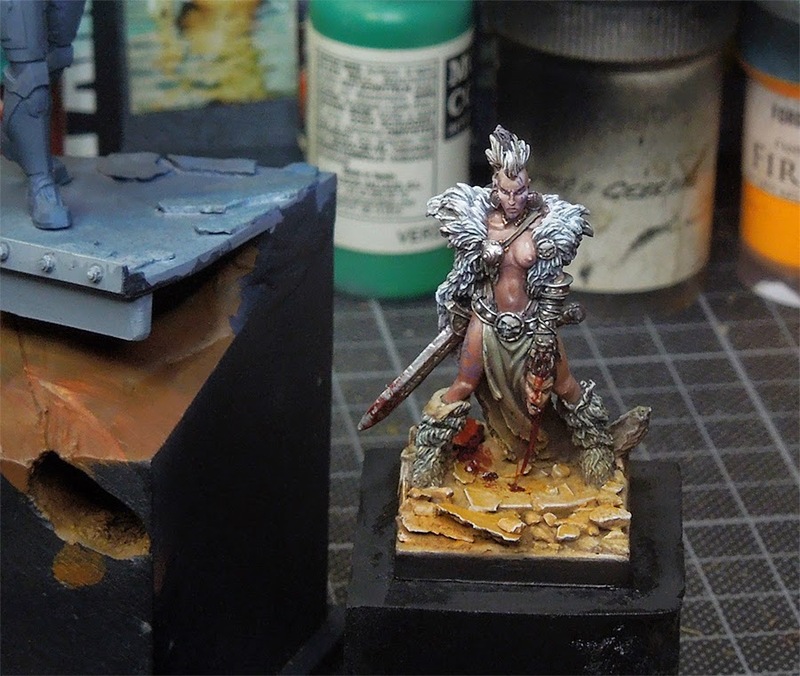 Base, skin, clothes, metals and leather. 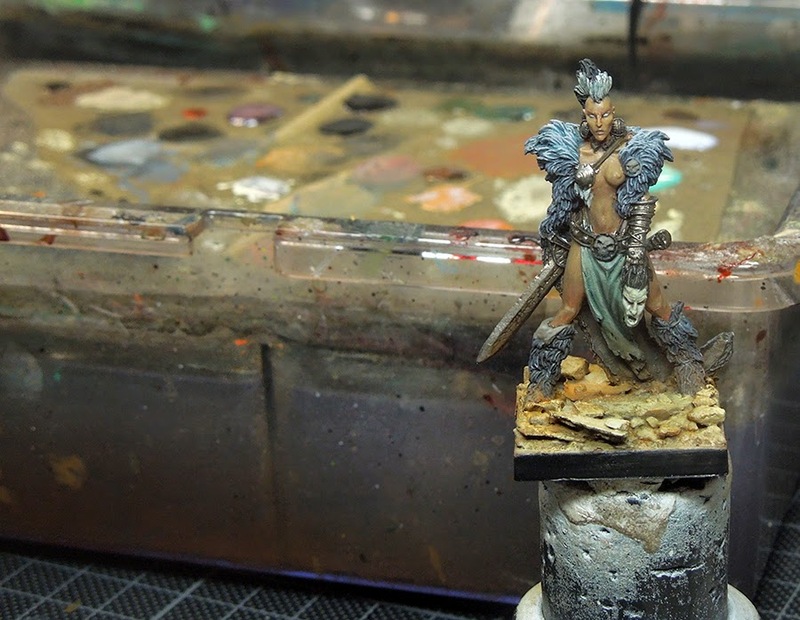 I even was in the mood to throw some sandy pigments to the base to make her boots look more dusty. Don't ask me why, I just did. Well, I now got interested in working on the fur and the skin parts as those make most of the model. So far the skin was too yellowish, so I took some skintone that is more reddish or pink to work further on the skin. The fur recieved some detailed lights in a blue grey to seperate single hairs from eachother. 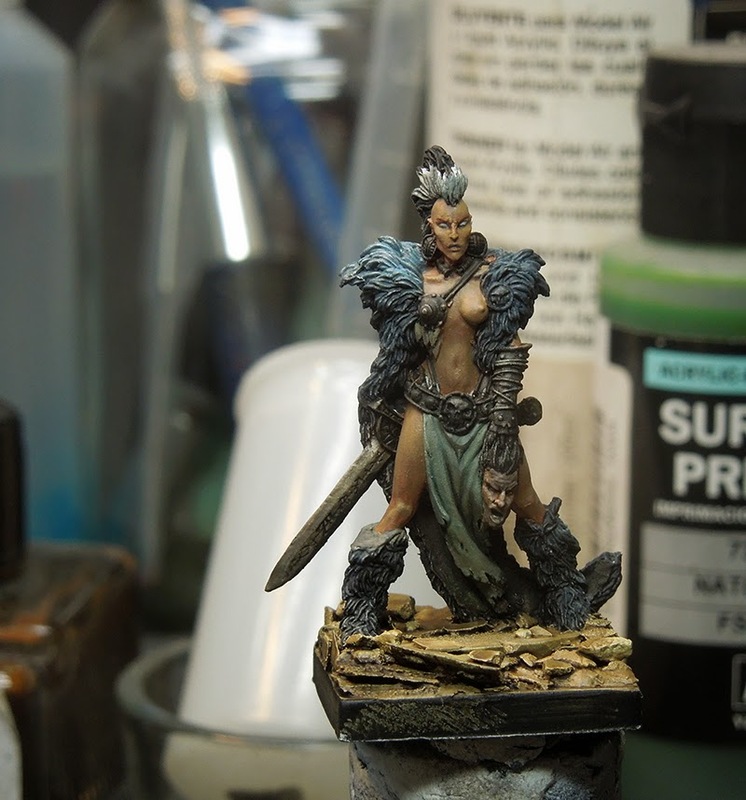 Also her mohawk recieveda dark wash to have the different hair seperated from eachother. After this I went for some details on the metal. Working with a brigher metal tone here to give the pieces volume. 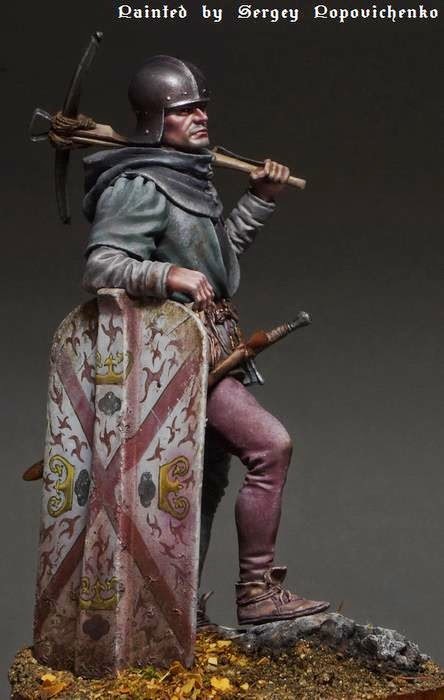 The skin also recieved some glazes of dark red-brown to make out the shadow situations even better. You can see the red glazes really come into play on the following photos. Additional to that I did some darklining. That means I seperated different material from eachother by using a dark brown line between both of them. You can see that pretty good on her leg to the fabric, on the fur and leather parts to the skin. 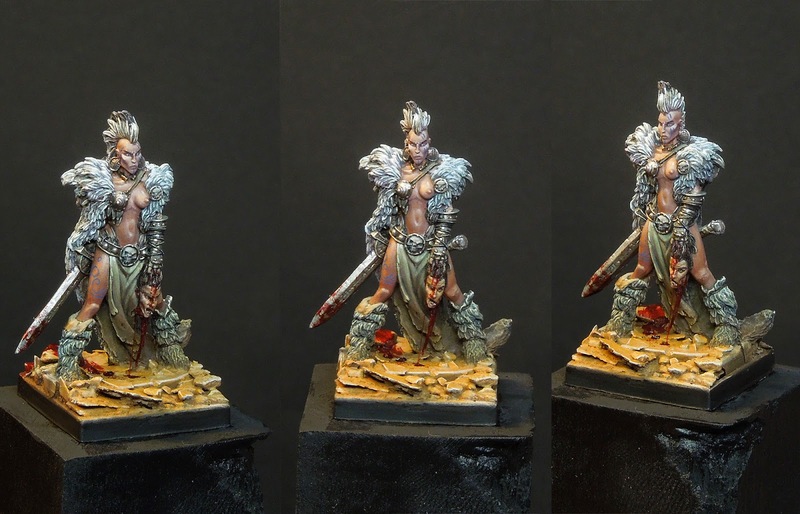 Now it was time for final lights on the skin, fur and some blood effect. Using a a bright blue for some tribal paint. In this case I did not want to have it look like a tattoo. If I would have gone for the tattoo I would have mixed in some skintone into a darker blue to make it look more included in the skin. This time I wanted to have it look like paint, she painted on her skin before the battle. 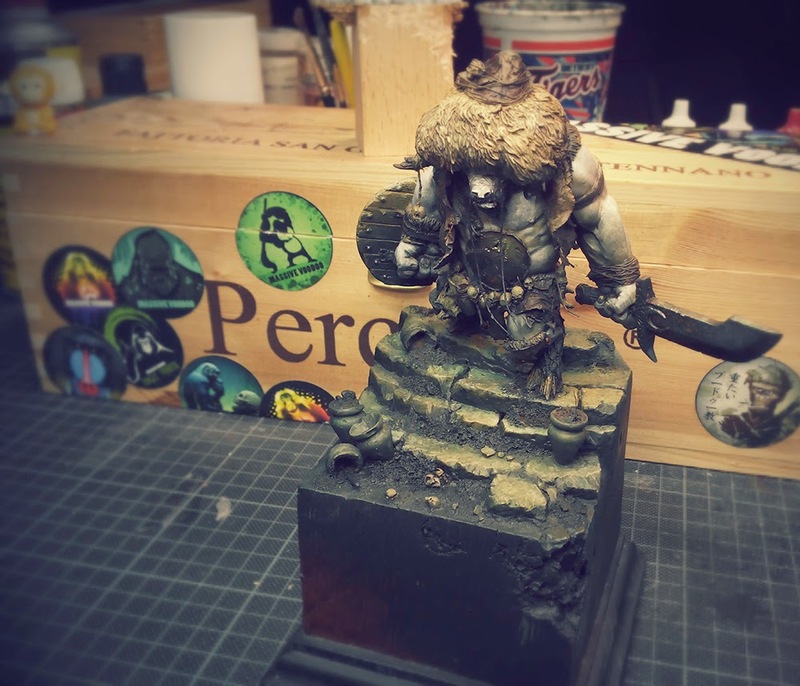 The base recieved some edge highlights on the stones. Leather parts recieved some more light and as I decided to make these models of my collection decent ones I felt the end coming closer. The blood string from the fresh severed head was made in this way: Blood & Gore and Blood Drops. Instead of Raffa's hair I used a piece of clear plastic here, like one I have I used here to create waves or waterfalls. She looked like this in my cabinet and I was already happy with the result. Well, this was not a very strong article. I know, but I do hope that some of you might find inspiration in it.